This entry was posted in Uncategorized and tagged Alplains, Mammillaria wrightii. Bookmark the permalink. They’re so cute when they’re little. Wishing I had put my Alplains order in sooner. They’re backlogged in shipping until March. Looks like I’ll have to break out the mini-fridge to chill things. There’s so much conflicting information about germinating seeds that I try all sorts of methods. 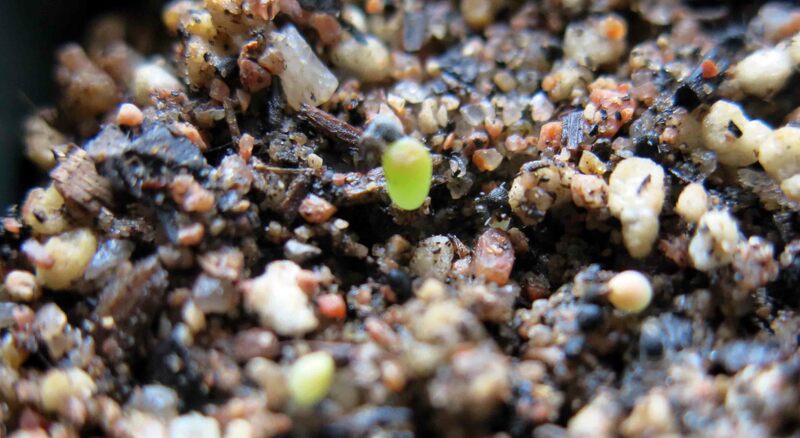 Most information says that echinocereus seed germinates at 70 degrees with no other treatment needed, but Deno insisted that GA-3 was an absolute requirement. I always sowed my echinocereus outdoors in January, got a few seedlings, and thought that was good enough. Right now I’m trying the 70 degree method, like they were tomatoes or something. 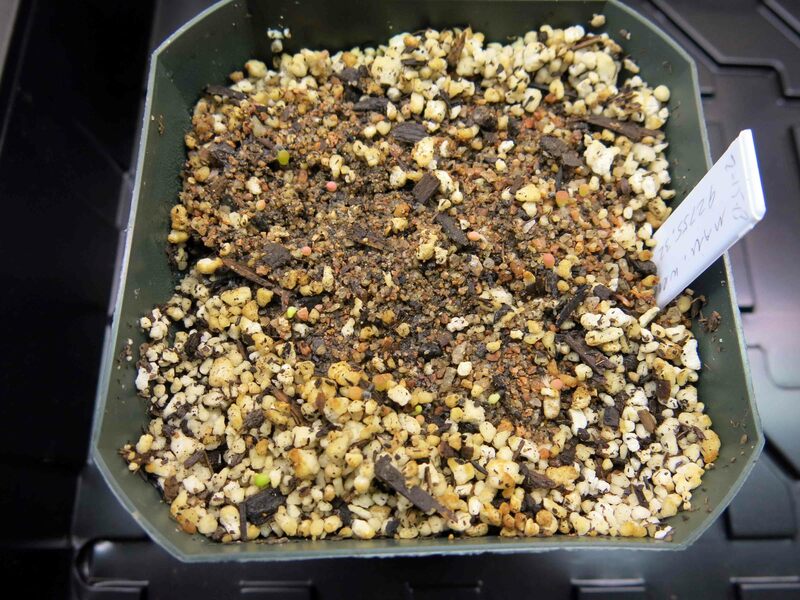 I did buy a GA-3 kit from Hudson and treated seeds of Penstemon caryi, retrorsus, and tusharensis just last night. Sowed the seed in pots outdoors today. There’s still plenty of time. Congratulations on your plant parenthood! Will you be passing out cigars? They have cigars that have “it’s a boy” or “it’s a girl” on them. (Why “it’s”?) Since cactus flowers are almost always bisexual, well, uh, hmm. Very, very cool! I’ve never seen starts of cacti, just once up and larger! First time I’ve tried sowing them under lights. This one took about four days. Usually I sow them in pots outdoors, and get one or two plants per pot, or …..I forget to water them at the right time, the seeds dry out and die. 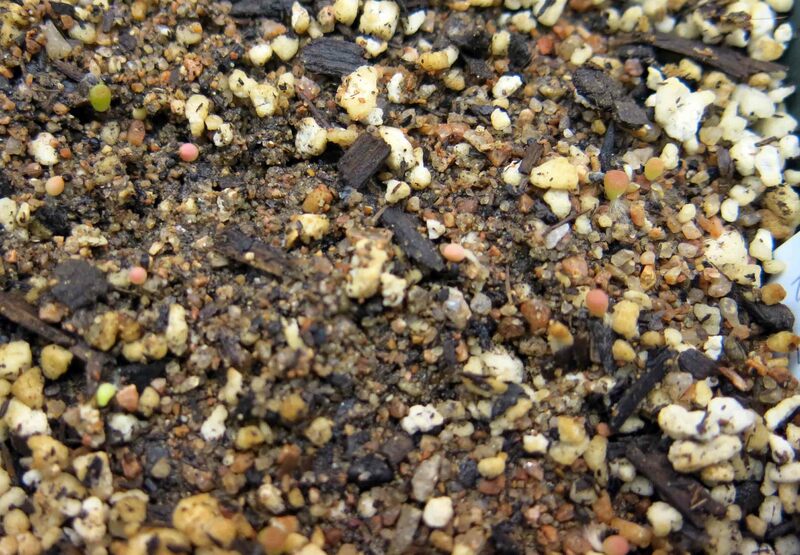 Tiny cactus seedlings grown outside are prey to all kinds of creatures that think they’re little green gummi bears.